Trash companies be warned. This is County Waste territory. 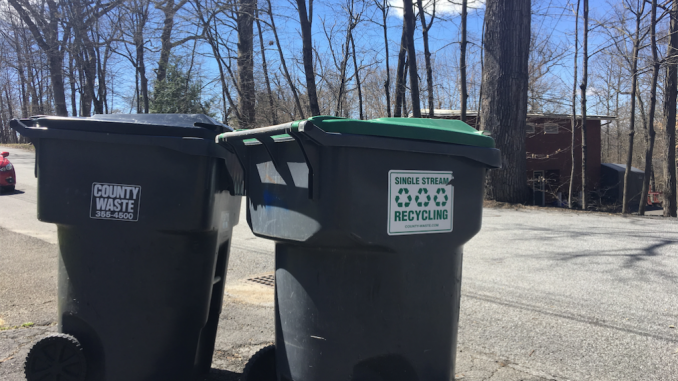 Michael Russo, a driver of a Russo Sanitation truck, was the first to face the consequences of violating the single-hauler law in the town of New Paltz, which rules that only County Waste can provide residential trash pickup. On Monday, March 25, Officer Ronald Stroh pulled over Michael outside a four-family home at 137 South Ohioville Rd. Stroh proceeded to search, handcuff and place Michael in the back of the police car. “I didn’t think it was right that he was embarrassed that way, anybody passing by would think that he was being arrested and taken to jail. Not to mention that also wouldn’t look good for the company in general,” Joe said. Michael was warned that if he was caught servicing residential locations again, he would be arrested and the truck would be impounded. “When I called to question and to complain, I said to them being that this is not a felony or a misdemeanor, I could not see why it was necessary that he be treated as if he was a criminal,” Joe said. Since June 2018, County Waste has been the only permitted hauler in both the Town and Village of New Paltz under a five-year contract, which was spearheaded by Village of New Paltz Trustee Dennis Young. According to Young, more than half the country has some sort of single-hauler law in their community. The idea behind this law is to lower the number of garbage trucks on the road, thus reducing the amount of carbon emissions, the amount of traffic and the impact on the tax payers’ roads. Even though residents are not legally required to sign up for County Waste’s services and outside garbage haulers may still service commercial residences, those who oppose the single-hauler law strongly believe it violates freedom of choice and attempts to create a monopoly over trash services. Young called out to all haulers on Dec. 12, 2018 to notify them that New Paltz police will begin enforcing this law. Lieutenant Robert Lucchesi reached out to haulers twice in February 2018 alerting them of the upcoming enforcement and clarifying that haulers cannot collect roadside containers from residences, even if the hauler considers it to be a commercial account. County Waste also mailed an announcement flyer to every house that has been impacted by the change. Yet the interaction between Michael and the police seemed to only add fuel to the angered community members’ existing fire. The ticketing and handcuffing of Michael highlighted a discrepancy in the definition of residential versus commercial homes. Stroh issued Michael a summons to appear in the Town Court of New Paltz on April 9 at 6 p.m., but the court meeting was adjourned until next Tuesday.